Welsh rugby legend Phil Bennett says Leicester's Owen Williams is in pole position to start at fly-half for Wales in South Africa. Bennett was disappointed with Rhys Priestland's and Dan Biggar's performances in Sunday's Pro12 Welsh derbies at the Millennium Stadium. He says Williams has moved ahead of his rivals for the jersey. "Without playing [Williams] overtakes them because he's playing so well in the Aviva," he said. 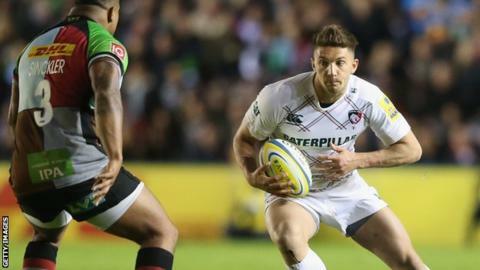 Leicester fly-half Williams has played a starring role for the Tigers in the English Premiership this season. But Williams, 22, has overtaken England fly-half Toby Flood and is being tipped by Bennett to play for Wales on their summer tour to South Africa in June. Bennett who was fly-half and captain during Wales' 1970s golden era and a star of the British and Irish Lions' invincible 1974 tour to South Africa, was not impressed by Gatland's first choice fly-halves on Sunday. Biggar was part of an Ospreys side who were frustrated for large spells of their 20-10 win against Newport Gwent Dragons. Priestland scored a try in the Scarlets' 17-13 defeat to Cardiff Blues but missed an easy conversion in front of the posts and was taken off before the end of the match. "Rhys Priestland is such a talent," said Bennett. "But you've got to realise they are not kids anymore. We are talking about men who are earning good money playing for teams they want to play for and I think Rhys would be disappointed at his performance [Sunday]. "His kicking out of hand wasn't great and that simple missed conversion, two points, so vital to build up confidence. "I looked at him when he was subbed and he was crestfallen. He was devastated. "Young [Steven] Shingler came on and played quite well so he knows he's got a fight on his hands and that's how it should be. "You feel a bit sorry that the Welsh number one is pulled off and with 20 minutes to go. "Instead of controlling the game he is on the bench."